The world’s largest online professional network LinkedIn could face a ban in Russia after the company has failed to comply with a Russian data localization law that compels companies to keep data on Russian users in their country. 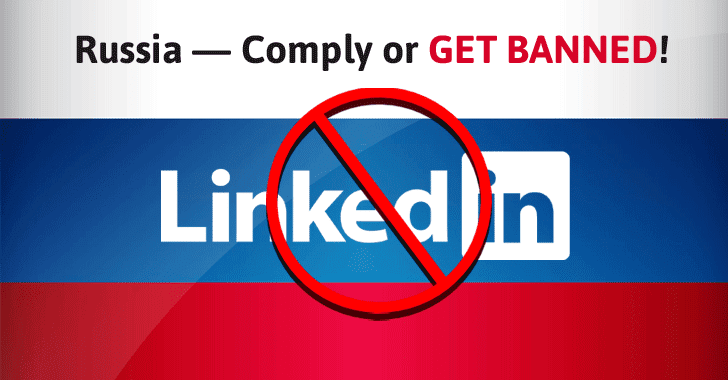 If you are not aware, LinkedIn is the only major social network which is not banned in China, because the company agreed to cooperate with the Chinese government and remove controversial content. However, LinkedIn could be the first social network in Russia to be blocked by the Russian state’s federal media regulator, called Roskomnadzor, for not complying with the rules. In July 2014, the Russia approved amendments to the Russian Personal Data Law which came into force in 1st September 2015, under which foreign tech companies were required to store the personal data of its citizens within the country. However, Russia was not the first country to enforce such law on foreign tech companies. A few months ago, Iran also imposed new regulations on all foreign messaging and social media apps to move ‘data and activity’ associated with Iranian citizens onto servers in Iran within one year. The law was in an attempt to protect its citizen’s data from the NSA’s mass surveillance revealed by whistleblower Edward Snowden. Big technology companies, such as Google, Apple, and Viber, have reportedly already moved some of their servers to Russia this year. However, companies like Facebook, Microsoft, Twitter denied complying with the law. But, the Russian Internet watchdog Roskomnadzor has targeted LinkedIn in its first attempt to pressurize foreign companies to comply with its new privacy law. Roskomnadzor has chosen LinkedIn its first target due to the company’s history of security problems. The massive 2012 hack in LinkedIn exposed over 117 Million passwords and usernames. "They have a bad track record: Every year there’s a major scandal about the safety of user data," Roskomnadzor spokesman Vadim Ampelonskiy told the Moscow Times. Roskomnadzor said not even LinkedIn refused to move its servers to Russia, but the company also collects and sends data about its citizen who are not even users of the social network without their consent. "We are seeking a court order to block LinkedIn. We twice sent requests in the summer, but they did not provide answers to our questions," Ampelonskiy told the TASS news agency. Moscow’s Tagansky District Court has also ruled in favor of the Roskomnadzor, though LinkedIn has appealed to a higher court for removing the ban. The Moscow City Court will announce the decision on November 10. The watchdog says they will remove the ban if the social networking company provides information that it has comply with the law and moved its servers with data about Russians to their country. Roskomnadzor – also known as the Federal Service for Supervision in the Sphere of Telecom, Information Technologies, and Mass Communications – is Russia’s telecoms watchdog that runs a huge blacklist of websites banned in Russia.